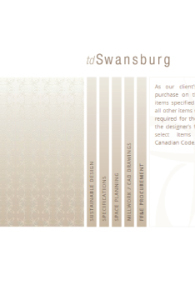 Another reason Meade Design Group is considered the ‘Designer to the Designers’: We have recently completed Vancouver and Victoria-based interior design firm, TD Swansburg’s website. We worked closely with founder and principal designer, Teresa Ryback on revamping her online presence to suit her aesthetic. Small Space, Tight Timeline, BIG Impact! Meade Design Group is proud to introduce one of our recent interior design projects at The Hudson Building in Victoria BC. An international tech company was in need of a suite where their executives could stay in the city without the need to book a hotel. The requirement was to design a home away from home on a short time line. The executives for this company are mostly men and the inspiration was a masculine lodge blended with mid century modern influences. 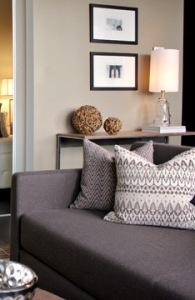 Rust oranges, warm wood tones and geometrics add personality to this small space. For accessories we went for a mix of tribal and industrial elements. Please visit the blog to see more photos and information. This project is also featured within the /showcase/”>’Showcase’ section of our Interior Design Gallery. Looking for some tips and tricks to spruce up your usual holiday decor? 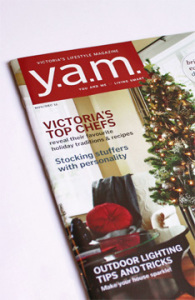 Check out our latest appearance in Y.A.M Magazine! Our principal, Ivan Meade has included some of his personal favourite ideas for making your home feel extra festive this time of year, including techniques he has used in his own home, and here at our studio. The article also features great suggestions from other local design industry professionals which made for a diverse selection of options and styles! This issue is out now, so be sure to pick one up for yourself today! – your home will thank you for bringing new life to your Christmas tree, your mantle, your pillows, your entry, your table, and… well, you get the picture!